What is SAP Global Certification and why it is important? SAP SE is a German-based European multinational software corporation that makes enterprise software to manage business operations and customer relations. SAP is headquartered in Walldorf, Baden-Württemberg, Germany with regional offices in 180 countries. The company has over 425,000 customers in over 180 countries. SAP means Systems Applications and Products in Data Processing. SAP by definition is also the name of the Enterprise Resource Planning (ERP) software as well as the name of the company. SAP is the No. 1 in the ERP market. The competitive products of SAP Software in the market are Oracle, Microsoft Dynamics etc. Now keep in mind that SAP as a company is going strong since the early 1980’s and it doesn’t appear that they are anywhere closer towards declining trend. Irrespective of many competitors, SAP has always maintained to stay ahead and updated. Considering all of these aspects, it is safe to assume that your career in SAP could be quite rewarding. There are many ways to ensure a stable job as an SAP consultant about which we are going to discuss in detail. Why should I get myself SAP Certified? SAP is one of the most sought after career option today and the major reasons behind this are Fast Career Growth, Wider spectrum of opportunity in the global market, gain international recognition and instil client confidence, Best Compensative Jobs in IT domain, Ample Opportunities to work abroad and one of the most important reason is Job Satisfaction. You may have come across many training institutes who offers trainings on various SAP modules for a price that seems too good to be true. Many young aspirants often join such institutes to save money. The drawback of such institutes is that the kind of knowledge and hands-on experience that is required for one to clear the interviews and perform better while on job is not up to the mark which is often experienced by the candidates post the training period is over. Also, as long as the idea of getting trained from such institution is only for knowledge enhancement, it is fine and acceptable, however, when it comes to employment especially if you are starting fresh into SAP, it is highly recommended that you get yourself SAP certified. The globally acknowledged SAP certification examination is an important benchmark of consultant expertise, making SAP Education a must for all functional managers and IT professionals. As this is so important for any business, companies tend to offer jobs to certified professionals over only trained candidates. This is one of reasons why SAP certified professionals earn more than anyone else in IT sector. With SAP Globally recognized certification, it helps demonstrate that you have honed your skills through vigorous study and hands-on experience in your chosen field. SAP offer certification programs by area of focus and skill level – whether you’re a fresher, experienced professional, SAP partner, customer, or end user. 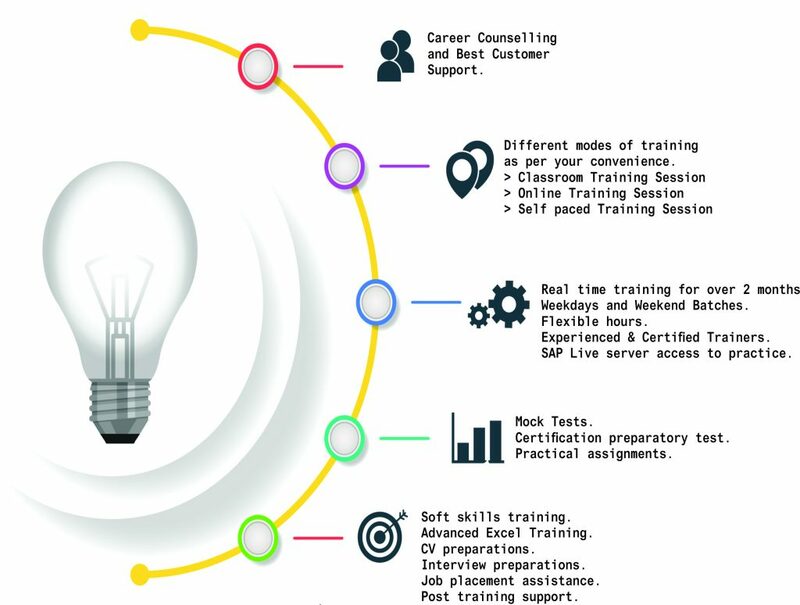 If you are thinking of SAP Certification looking at career growth then, Authorised SAP Training Centre with best training and placement record plays vital role. There are few ways one can think of getting themselves SAP certified. Now, if you are in India and you are working with an SAP Partner Company as an SAP Consultant for several years, in such scenarios, it is common for the companies to sponsor your certification process. However, such opportunities are not made available for every employee. So, alternatively, people often opt to get themselves enrolled in SAP Authorized Training Centre, paying a huge fee depending on the mode of training selected and then later to appear for certification exam post training. Both the above mentioned options can seem far-fetched for many many aspirants. It can be due to the cost or the waiting period in an organization. To start your career in SAP, it is highly recommended that you get yourself SAP Certified. SAP offers various certification for different modules. As of today there are 220+ different certifications on offer. Delta certification – For some parts of the portfolio, SAP offers Delta exams to ensure that SAP certified Consultants are up-to-date with their skills and knowledge. You are eligible to take a Delta exam when you pass the prerequisite Associate exam for a specific solution. A Delta certification exam consists of 40 Multiple Choice, Multiple response, Matching (pull-down) questions and answers and takes 90 minutes. Specialist certification – This certification is in addition to an Associate certification and focuses on a specific role or integration component. A Specialist certification exam consist of 40 Multiple choice, Multiple response and Matching (pull-down) questions and answers and takes 90 minutes. An Associate certification exam is a required prerequisite for taking the Specialist exam. For SAP there are no specific criteria if you are enrolling for basic modules of SAP; any graduate can pursue their career in SAP. However, some SAP modules require relevant work experience in field like engineer graduate with relevant work experience of minimum two years can take a course in SAP MM, PP, and PM module while a commerce graduate or MBA can choose SAP FICO. Why to choose Zenfotec for your SAP Certification and Training? There are many authorized training centers who are SAP Education Partner who claims to provide good placement records and more. However, what is important to note that one should not fall for such promises. Having said that, the efforts made by such training institutes to assist its candidates in job placements by calling the IT recruiters to its premise or sending the certified candidates for the interviews should be appreciated. The reality is no one has control over the job market and who gets placed. It mostly depends on the persons ability to demonstrate his or hers skills provided the faculty who has imparted the training has done a job well done. Knowing that, it is important to understand on how much can a person learn in 20 days from 9 am to 6 pm regularly, that too with a limited access time with SAP Live Server for practicals. You will find many such cases of the students who have paid a huge fee and are still lacking in knowledge and jobs. At Zenfotec, we understand these challenges and we have developed a very unique and interactive way of training our students. Zenfotec is not an SAP Education Partner but; it is an SAP Authorized Training Institute as Zenfotec is associated with Dexler One, sister company of Dexler Information Systems Pvt Ltd, Bangalore. Dexler One is into SAP Education services and is also an SAP Strategic Partner. Zenfotec being powered by Dexler One is in a position to provide its candidates an unique opportunity to get themselves SAP Globally Certified for quite an affordable cost. Complete end to end training, covering every topics with real time scenarios and explanations. The course duration is spread across 2.5 months for 200 hours which ever comes earlier. 15 plus years of experienced and certified trainers. Choosing a right institution is of utmost importance. Ensuring what you get in return after paying an hefty price is equally important. Many a times people who complete their training and get a job as SAP consultants realize how differently they could have done the SAP certification course and how much money they could have saved. At Zenfotec, we understand common mans challenges and aspirations. We have a team of dedicated and passionate trainers ensuring that you get knowledge on complete end to end scenarios. 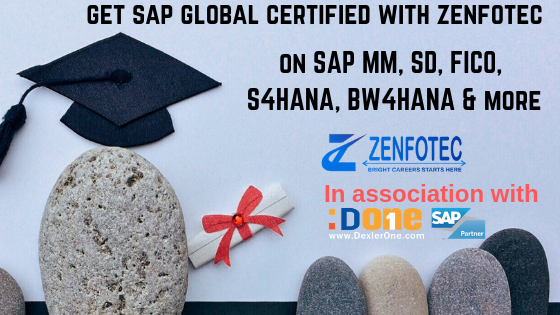 Zenfotecs goal is to make SAP Certification and Training affordable and provide the industry resourceful and knowledgeable candidates.